There are so many good reasons why potassium should be included in the diet. For starters, potassium is an essential mineral that is required for electrolyte balance and maintaining fluid in the body. Potassium is also the third-most abundant mineral in the body, required for the function of various organs, including the brain, kidneys, heart, and muscular tissues. Potassium also plays a key role in keeping the body well-hydrated. It works with sodium to support cellular function as part of the body’s sodium-potassium pump. This article is a useful tool that details potassium health benefits, the effects of having low potassium, and provides you with a food chart that lists the best potassium-rich foods for the body. Although there are many benefits of potassium, problems may occur when there is low potassium in the body. The body is constantly balancing potassium and sodium. When potassium goes down, sodium goes up; and when potassium goes up, sodium levels go down. This is a good reason why an imbalance of sodium, or salt intake, can result in a greater need for potassium-rich foods. A potassium deficiency is uncommon because potassium is found in a wide variety of foods. That being said, you may have potassium deficiency if you exercise without proper hydration, consume a diet low in vegetables and fruit, and experience excessive fluid loss through sweating, diarrhea, or vomiting, or from taking certain medications like laxatives and diuretics. Poor blood pH, hormone levels, and kidney function also contribute to low potassium levels. There are major benefits of getting enough potassium in the diet. For instance, the body requires potassium to process and utilize carbohydrates. Adults and children need potassium to build muscle and protein. For children, potassium foods are necessary for ensuring normal and healthy growth. The following are six more of the many purported potassium health benefits. The rhythm of your heart is very important, and potassium plays a direct role in making sure your heart beats at a normal rhythm. People with heart rhythm problems may even be suffering from a potassium deficiency. 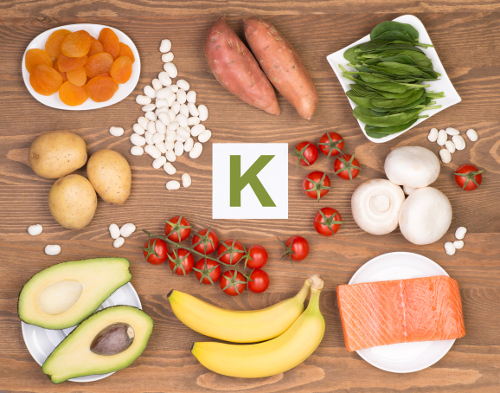 Potassium promotes an alkaline environment in the body, and is triggered by a diet full of acidifying foods like dairy, meat, and processed grains. This can cause bone mineral density loss, nitrogen excretion, and muscle wasting. One study published in the American Journal of Clinical Nutrition found that consuming over 5,000 milligrams of potassium daily can help a person maintain an average of 3.6 percent higher lean tissue mass than those with a potassium intake 50% lower. Research also shows a bone density increase in diets with high potassium. A study published in the journal Osteoporosis International in 2015 found that high consumption of potassium salts can significantly reduce urinary excretion of calcium and acid. As a result, you can preserve your bones and prevent bone-related health problems like osteoporosis. Another one of the great benefits of potassium is its reported ability to reduce muscle cramping. Common side effects of low potassium include muscle cramps, muscle aches, and muscle weakness. Cramping is very common when athletes become hydrated, and don’t consume enough potassium-rich foods before and after exercise. Potassium is very important for regulating blood pressure. The vasodilating properties in potassium help relieve blood vessel tension—a major cause of hypertension. The average American diet contains too much sodium, and not enough potassium, according to a publication from Harvard Medical School. Research shows that a potassium-rich diet from fruit and vegetables can reduce high blood pressure. The idea here should be to increase potassium food intake without increasing the intake of high-sodium foods. Potassium has a main role in maintaining the electrical conductivity of the brain, which dramatically affects brain function. Potassium is also necessary for memory and learning. Also, potassium deficiency is linked to brain-related diseases like epilepsy. Consumption of potassium-rich foods may therefore improve neural function, and help regulate electrical currents throughout the body. Low potassium levels can cause a drop in blood sugar. Low blood sugar can cause headaches, nervousness, trembling, sweating, and weakness. Potassium and sodium can immediately remedy such blood sugar problems. As a result, diabetic patients are required to keep their potassium levels normal to help stabilize blood sugar throughout the day, and lower the unpredictable highs and lows related to glucose and insulin levels. The daily potassium recommendation of 4,700 milligrams is a lot. As a result, people often have trouble getting enough potassium each day. According to the National Health and Nutrition Examination Survey, the average American gets around 2,640 milligrams per day, and fewer than 2 percent of the population meet the daily recommendation. In fact, women consume even less than men on average. The World Health Organization recommends less at 3,510 milligrams daily, but most people still miss the mark. What foods should you consume on a regular basis to meet potassium requirements? Some people think bananas are the best source of potassium, and although they are a good source of potassium, there are several other fruit and vegetable options that are even better. The following is a potassium food chart that is a useful tool to help you learn what foods can help you avoid a deficiency. The chart contains the high-potassium foods available. Overconsumption of natural potassium sources is rare unless you’re receiving cancer treatment, on dialysis, or you have another specialized health condition. That being said, you can consume too much potassium from potassium salt sources, which can lead to vomiting and nausea. Potassium is a very essential mineral for the human body. It is not just a mineral; it’s also an electrolyte. As a result, there are numerous advantages of consuming potassium-rich foods, the preferred source, on a daily basis. When you don’t get enough potassium from your diet, potassium-deficiency symptoms can be the unfortunate result. You also miss out on all the possible potassium health benefits for your heart, bones, muscles, brain and more. Mateljan, G., The World’s Healthiest Foods: Essential Guide for the healthiest way of eating (Seattle: George Mateljan Foundation), 776-778. Ware, M., “Potassium: Health Benefits, Recommended Intake,” MedicalNewsToday; http://www.medicalnewstoday.com/articles/287212.php, last updated Dec. 2016. Ward, E.M., “Are You Getting Enough Potassium?” WebMD; http://www.webmd.com/food-recipes/features/potassium-sources-and-benefits#1, last accessed April 3, 2017. “13 Incredible Benefits of Potassium,” Organic Facts; https://www.organicfacts.net/health-benefits/minerals/health-benefits-of-potassium.html, last accessed April 3, 2017. “Potassium salts aid bone health, limit osteoporosis risk, new research finds,” ScienceDaily, January 14, 2015; https://www.sciencedaily.com/releases/2015/01/150114115340.htm, last accessed April 3, 2017. Dawson-Hughes B., et al. “Alkaline diets favor lean tissue mass in older adults,” The American Journal of Clinical Nutrition. 2008;87(3):662-665. D’Adamo, M., et al, “K+ channelepsy: progress in the neurobiology of potassium channels and epilepsy,” Frontiers in Cellular Neuroscience. 2013;7:134. doi:10.3389/fncel.2013.00134. Christensen, T., et al, “A Physiological Model of the Effect of Hypoglycemia on Plasma Potassium,” Journal of Diabetes Science and Technology. 2009;3(4):887-894.